Hydrogen faces an uncertain future. Plug Power (NASDAQ:PLUG) has had promise as the next big technology company in transportation and energy for most of the past decade, but it's never come close to realizing its potential. The company has a foothold in hydrogen fuel for forklifts at large customers like Walmart and Amazon, but it hasn't been able to turn those big customers into bigger markets or long-term profits. So far in 2018, Plug Power's stock has fallen by 44.5% as investors continue to be disappointed by results. Here's why the year hasn't turned out as planned and why the bright future investors once saw may never arrive. Management has been predicting Plug Power will swing toward profitability, or at least positive EBITDA, for years now. But it hasn't happened and even growing revenue isn't helping the bottom line. In the past year, even gross profit margin has been negative, showing just how much the company struggles with costs and pricing power. PLUG Revenue (TTM) data by YCharts. Sometimes, low margins are justified for new, small companies, but Plug Power isn't a new company that is sacrificing profits for growth. 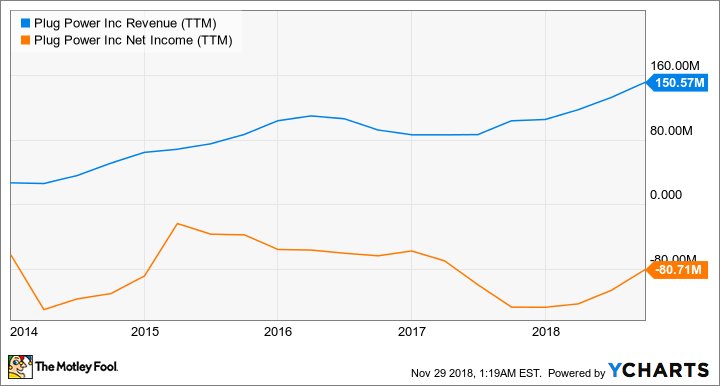 It signed its first major deal with Walmart in 2014 and management has been promising to be at least EBITDA breakeven for years, which the company has failed to live up to time and again. And the markets that management points to as its future growth opportunities may not be as attractive as they once seemed. When talking to investors, Plug Power continues to frame itself as an electric vehicle company, but it's still a hydrogen company and that's not where the big growth markets are trending. Sure, forklifts make a lot of sense as hydrogen vehicles, but commercial trucks, buses, and self-driving vehicles are moving toward battery power designs, not hydrogen fuel cells. Not only are Tesla, GM, Jaguar, and most other auto manufacturers eschewing fuel cells for batteries, bus manufacturer Proterra is gaining traction against fuel cell and fuel alternatives. FedEx, a Plug Power customer, recently announced that it will put 1,000 electric delivery trucks into service in California, bypassing hydrogen technology. There are also large truck manufacturers like Volvo that are now building electric options instead of fuel cells, which once seemed like a viable option for long-haul trucking. The fuel-cell industry once had an opportunity to beat batteries in some of these markets, but they weren't able to build scale or build fueling infrastructure to keep batteries from becoming more economically viable. Instead, we've seen the cost, energy density, and charging speed of batteries improve year after year, making fuel cells unnecessary for most vehicle manufacturers. Once batteries win, it's game over for fuel cells in most of these markets. Given all of the challenges, you may be wondering how Plug Power stays in business. The simple answer is that it's selling shares and taking out debt to fund operations. 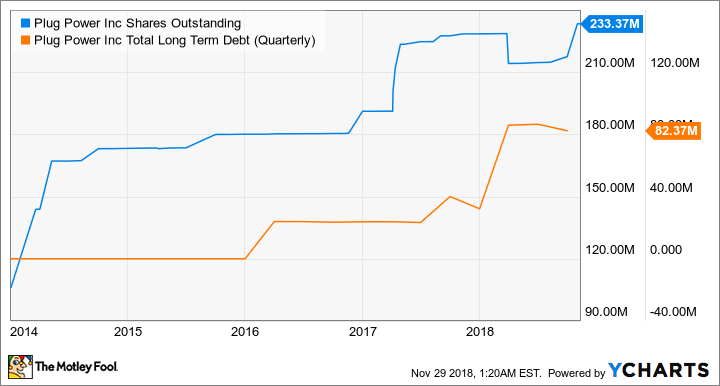 You can see below that over the last five years, shares outstanding have more than doubled and the company has taken out $82 million of debt to keep operating. PLUG Shares Outstanding data by YCharts. Selling shares is one option to finance operations, but taking out debt is a bigger risk in the long term. At the end of 2019, some of that debt will start to mature and if it can't service debt or find money elsewhere, it could run into real problems. Plug Power was once a high-potential business that could grow into multiple markets, but now it's struggling to make money even though it has big-name customers. Meanwhile, its purported growth markets are choosing competing technologies. None of this bodes well for the company in the long term, and I don't see a bright future for the stock -- even after the drop in 2018.